This month is Adopt A Shelter Pet Month. Instead of showing off my unforgettable, goofy Jack Russell Terrier, I’m highlighting a dog at the East County Animal Shelter in Dublin, Alameda County, California. This won’t really be wordless because of that fact. Senior dogs end up in animal shelters far too often. They are surrendered for a variety of reasons. Sadly, some people surrender senior dogs simply because they want a “newer” dog. Puppies are cute. But, senior dogs are special. They’ve got a lot of love to share and it is wrapped up in maturity…something puppies don’t have. Meet Chancho. He was surrendered at the Dublin Animal Shelter and he’s been waiting for a new family since August 27th. He’s a 7 year old Miniature Pinscher. He weighs in 11.8 lb. There are no special health issues or restrictions listed. He comes fully vaccinated. He will be neutered and microchipped before adoption. 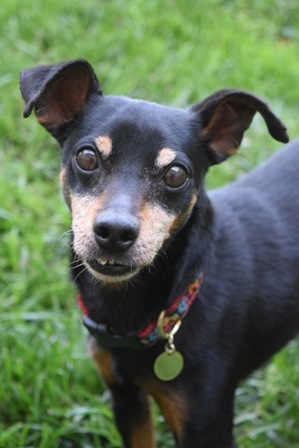 If you are looking to add a dog to your family and live in the Alameda County area, please consider Chancho. His adoption information can be found on Chancho’s Page. He’s already been waiting a month for a new home. Let’s see if we can find one! If Chancho isn’t right for your family, there are 14 dogs ready to be adopted at the East County Animal Shelter. There is bound to be one that will be just right for you! Check them out on the adoption page. This is the shelter’s contact information if you’d like further details: 4595 Gleason Drive, Dublin, CA 94568, (925) 803-7040. Well, he seems like a winner of a dog to me! Such a darling little face. I’m hoping your post helps connect him with the family he longs for. Jean, He does to me, too! I sure hope he finds his forever home soon. Chancho’s got a good long life ahead of him and I hope he finds his special forever home soon. He’s adorable! Elaine, he’s pretty cute, isn’t it? 7 isn’t old at all, especially for a small dog. I can vouch for the fact that that senior dogs adopted from a shelter or rescue make great pets. In the past we have adopted 3 senior dogs and all were wonderful pets – already trained in basic obedience and house-trained, mellow and sweet. Very little chewing or getting into mischief – well at least not nearly as much as the younger dogs we’ve had. (A little mischief makes life interesting!) They were happy to either just hang around in the house, go for a car ride or take a walk, but didn’t require a lot of exercise. Vicki, You have a big heart! It’s wonderful that you’ve rescued senior dogs. You’ve made some valid points about the benefits of a senior dog. Puppies can get into a lot of trouble. Not everyone has the time or patience to deal with puppy problems. I know that my own dog has become a more pleasant companion since she turned 5.